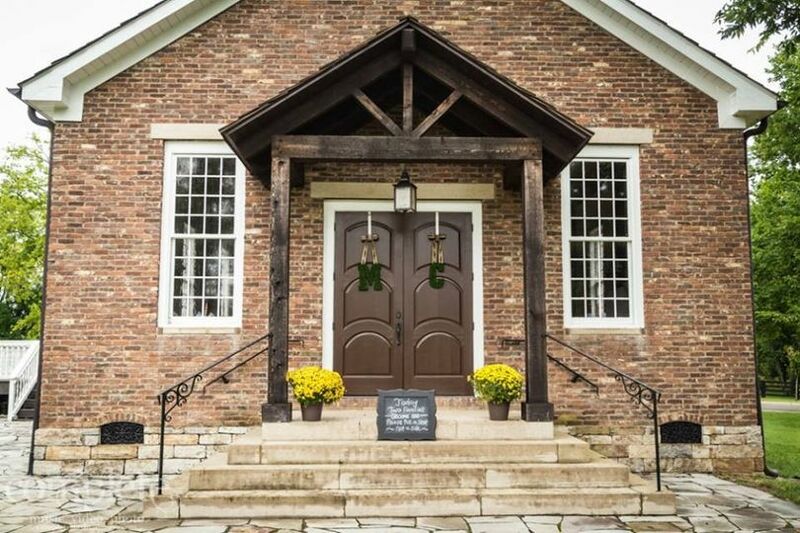 Kings Chapel is a rare, historic chapel located in Arrington, Tennessee. It was reconstructed from its original footpoint from 1804. The property also includes a clubhouse just steps away for your reception. 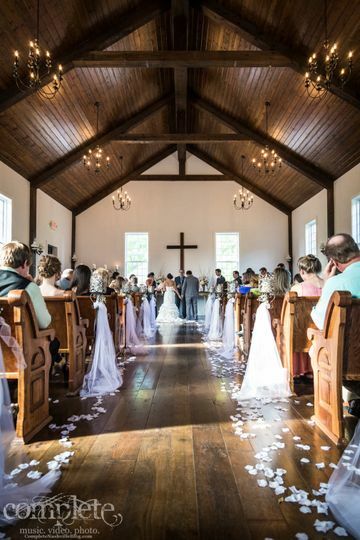 Kings Chapel offers couples a beautiful setting with rolling hills and breathtaking sunsets in Middle Tennessee. 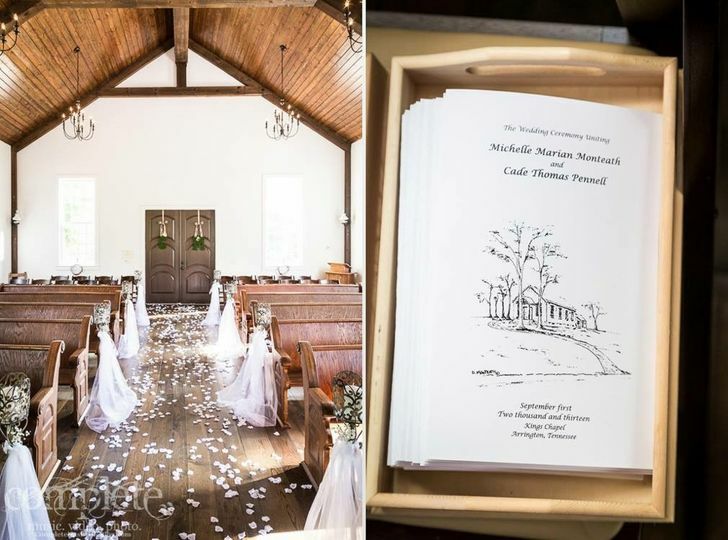 Couples can accommodate up to 400 guests at this rustic venue. 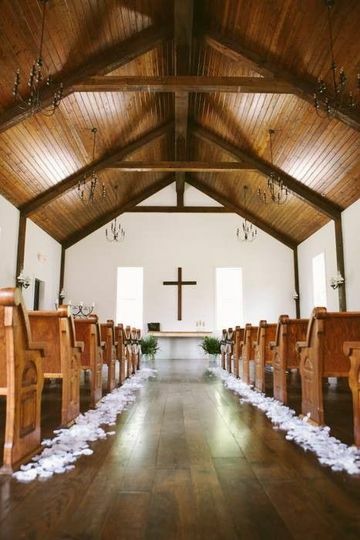 The restored, historic chapel is simple yet elegant. 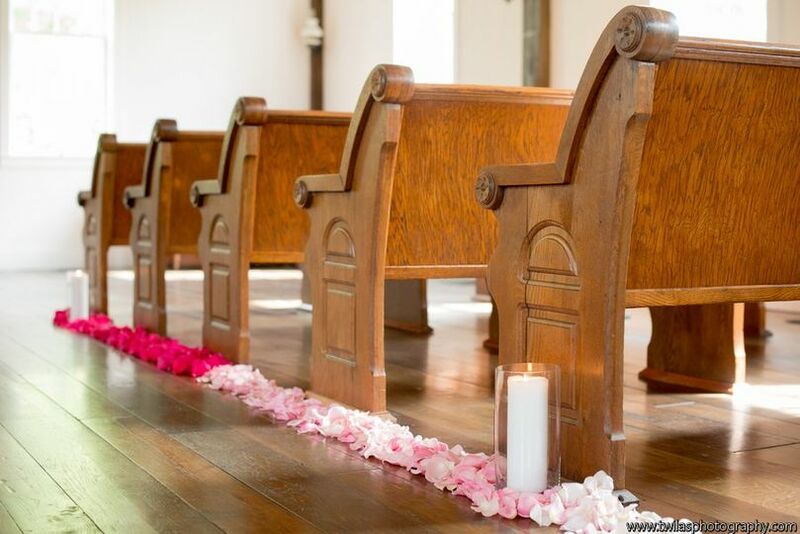 The chapel pews seat 96 guests but additional seating can be added to seat 175. They also added modern amenities such as air conditioning, heat, electricity and restrooms. For your reception, they offer indoor, outdoor and poolside options. The majority of couples choose the Clubhouse, which boasts walnut floors, wainscoting and French glass doors that open up to their covered deck and patio. 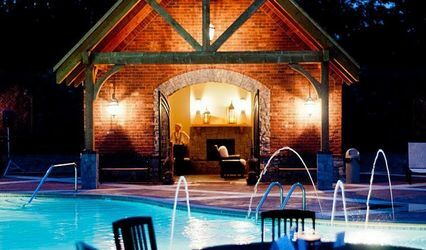 The front of the Clubhouse faces their resort-style pool and cabana. 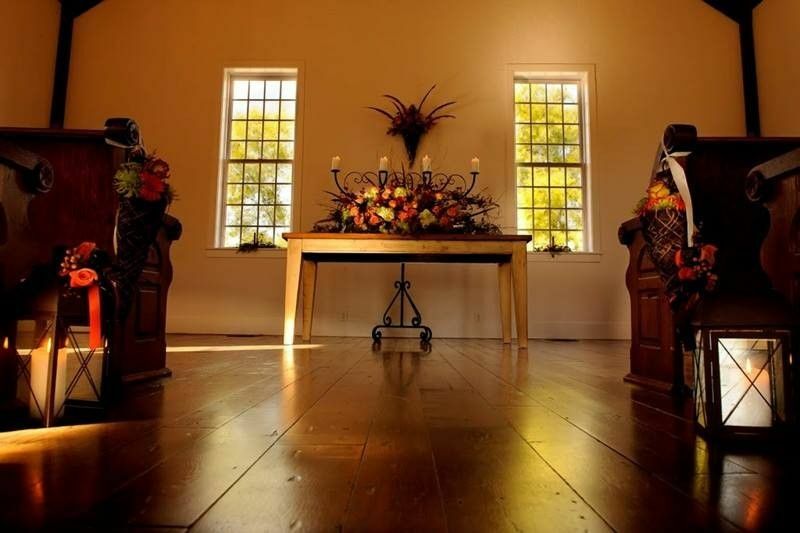 This venue is located in a gated community of 700 acres in Arrington, Tennessee. They’re 11 minutes away from both Franklin and Murfreesboro. Downtown Nashville is 30 minutes away. Everyone wanted to make sure everything was just the way we wanted it for their special day! The entire team was great! I would use you guys again! Kings Chapel made our special day awesome. 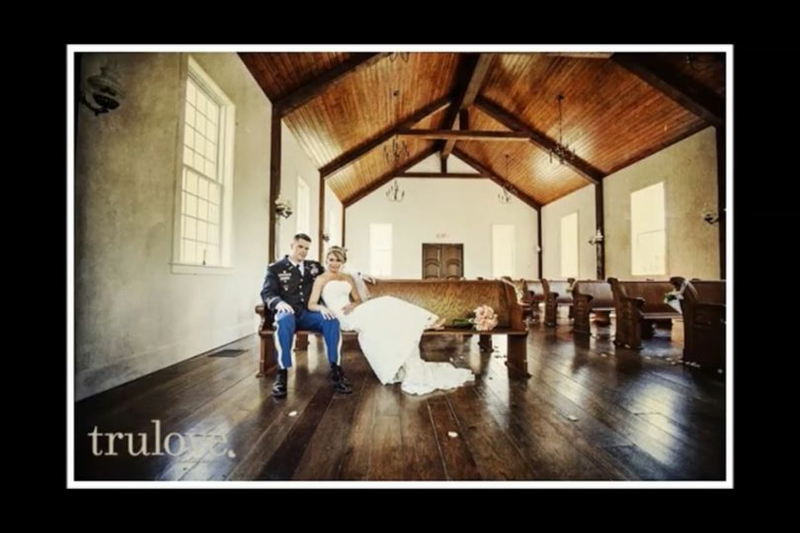 We were married in the quaint 1800's chapel and had 100 attendees. It was perfect and the club house was the scene of the reception. The beautiful club house is a great for photos on the back deck overlooking beautiful property. Downstairs was perfect for the girls to celebrate and get dressed for the wedding. The Club at Kings Chapel has so many options and Laurie was instrumental in making everything perfect. 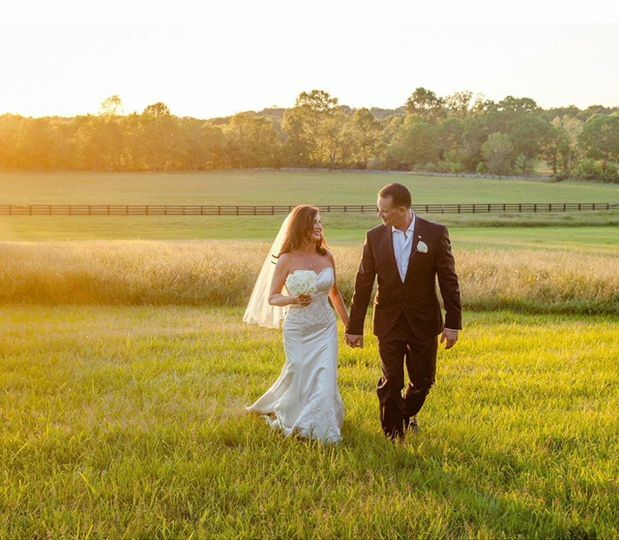 We were so glad we choose to have our wedding here and the memories will last a life time.